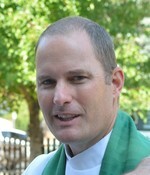 Emmanuel Episcopal Church - Rector's Msg. When I was young I saw a Sunday afternoon rerun of the 1960 movie The Time Machine. The idea seemed so cool, but terrifying (Morlocks!). The idea of time travel was and is compelling for several reasons, but two pop into my head most easily. The first is that time travel gives us the opportunity to see how it was (or will be), the second is that time travel gives the traveler the opportunity to change things (often with catastrophic results). It is that first reason that draws me to Holy Week. Holy week is the week leading up to Easter beginning with Palm Sunday on April 14th. It is a time in which there is much more interaction with the services than normal. We carry palms in procession and sing praises to Jesus the Lord. We are there with him as he makes his Triumphal Entry. We are also with him at his trial as we cry out, “Crucify him! Crucify him!” Then we move to the darkness and silence of Tenebrae, as the shadows lengthen and our betrayal becomes more clear. On Maundy Thursday we break bread with Jesus and his disciples at the Last Supper and strip the altar of all its finery, removing all signs of hope or celebration. On Good Friday we walk to the cross and see our Savior affixed upon it. We feel him take his last breath and die. The familiar hymn asks, “Were you there when the crucified my Lord?” Yes. Holy week took me there. Then in hope and joy we light the first light of Easter at the Vigil service and light again enters the world and hope is restored. As a sign of this truth, each of us hold a candle with that Light of Christ burning brightly on it. I do not have a time machine, but we all have access to the time machine of Holy Week where we can be brought into the time of Jesus and he can be brought into ours. The amazing thing about this time machine is that there is no “butterfly effect” or mistake that we can make that will throw it all asunder. Jesus has sealed the future with his life-giving sacrifice. I am already excited about this week and the challenge, pain, and hope that it will present to me. I hope to walk through it with you all well as we see the Lord and what he has done for us.